What: Top-notch brand marketers and media executives got together for Portada Los Angeles 2019 on March 15 to discuss passion-point marketing from sports to entertainment. Why it matters: The first Portada event of the year offered a unique opportunity for attendees to network, share knowledge, and learn about new ways to target the multicultural American consumer. Join us next at Portada's Data & Content Marketing Forum in NYC on April 3. By Ryan Orvis, Portada contributor. 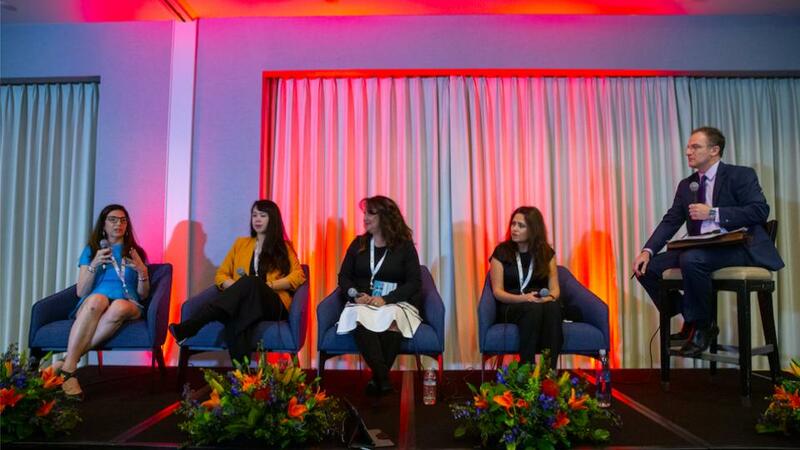 The top leaders in multicultural marketing converged at the Loews Santa Monica Beach Hotel last Friday for Portada Los Angeles. With a beautiful view overlooking the sunlit ocean, the hotel provided a serene backdrop for the event. The conference kicked off with a Thought Leadership Breakfast presented by CNN en Español and Portada. Representing CNN were Izzy Gonzalez, Director of Cross-Platform Sales, US for CNN en Español and Cynthia Hudson, SVP and General Manager of CNN en Español and Hispanic Strategy for CNN/U.S. Portada’s Marcos Baer and Janet Grynberg welcomed Izzy and Cynthia to discuss the importance of using media to connect with the Hispanic audience. The way people interact with changing technology provided a central theme. With 80% of their audience engaging with CNN through mobile devices, the company has needed to adapt their content strategy to reach users on the go. Cynthia concluded her introduction with an appeal to those in attendance to take a leadership role in fighting discrimination and encouraging voter participation. Robin Garfield, Frances Rubio, Roxanne Garzon, Caro D'Antuono, and Guillermo Arduino. The panel, titled 'How Data and Content Continue to Fuel the Evolving World of Advertising' was moderated by Guillermo Arduino, CNN Anchor and Correspondent for Encuentro (CNN en Español). The discussion involved Caro D’Antuono, Vice President of Marketing for Northgate Markets; Frances Rubio, Multicultural Marketing Analytics Associate Director for GroupM; Roxane Garzon, Media Director for Casanova; and Robin Garfield, Senior Vice President of Research and Scheduling for CNN. Key takeaways included the need for consistent data to inform content strategy, and the importance of interpreting that data correctly to develop an accurate audience profile. CNN's Thought Leadership Breakfast was followed by 'The Promise of Women’s Soccer: How Brands Use It for Activations', a panel featuring Sara Toussaint, Vice President of Sponsorships for Wells Fargo. Sara was interviewed by Dr. Jake Beniflah, Executive Director at the Center for Multicultural Science. They discussed how the 2015 Women’s World Cup final broke viewership records, opening the door for sponsorship opportunities in women’s soccer. Sara explained how she used that opportunity to connect with new audiences and deliver results. The next topic was 'Leveraging Data to Cash-in on Multicultural Consumer Growth'. Moderator Stephen Brooks, EVP of VidaPrimo, spoke with Ariela Nerubay, CMO of Curacao and Kate Canel, Director of Performance Media at The Shipyard. Ariela explained how credit card data can be used to target consumers who may be ready to purchase a specific product. Kate stressed the importance of owning first-party data in order for a business to scale, due to the lower cost of acquiring in-house data. Seraj Bharwani, Chief Strategy Officer for Acuity Ads led a presentation called 'In-Language or In-Culture? Decision Science Enables What Your Digital Approach is Missing'. He explained how targeting based on language is not enough to scale, and attribution models need to be able to understand cultural behaviors in addition to language preferences and nationality. To see all the event pictures, follow us on facebook by clicking here! As part of their ticket, attendees had the chance to sit down for one-on-one meetings with up to four brand marketers or media executives of their choice during the Portada Meet-Up session. Right after the speed networking session, Rajaa Grar, Senior Director of Global Brand Marketing at Paula’s Choice Skincare led the next discussion on 'Influencer Marketing: Why Passion and Shared Values are Key'. Rajaa’s insights included the importance of staying authentic to your brand’s DNA and valuing engagement rather than number of followers. Culture and loyalty played a large role in the discussion called 'Major League Teams Bet Big on the Hispanic Market'. Univision anchor Leon Krauze spoke with Rich Orosco, EVP of Brand and Community at LAFC, and Ronalee Zarate- Bayani, CMO for the L.A. Rams about their success connecting with fans in Los Angeles. They explained how authenticity and shared values formed the backbone of their marketing strategies. 'Passion-Point Movies' featured Paul Presburger, CEO of Pantelion Films and Pantaya in discussion with Dana Bonkowski, SVP, Multicultural Lead at Starcom. Paul explained the challenges of launching Pantaya, a premium streaming channel targeting the Latino audience. The brand has succeeded by staying true to their content standards and learning from their users. Many of their strategy decisions have been informed by first-party data from direct app purchases. Dana advised the audience not to panic if they don’t have first-party data, stressing that it’s only one part of the puzzle. In addition to Friday’s agenda, the three U.S.-focused units of Portada's Council System had their private meetings on Thursday: the Brand Star Committee, the Agency Star Committee, and the Sports Marketing Board. After their sessions, they networked during a special dinner & cocktail presented by Nascar, featuring Mexican driver Daniel Suárez. Attendees of the event left with strengthened relationships and strong insights to bring back to their respective companies. Portada hosts several more marketing events in 2019, with meetings scheduled this year in Miami, New York, and Mexico.